Love soya chaap? 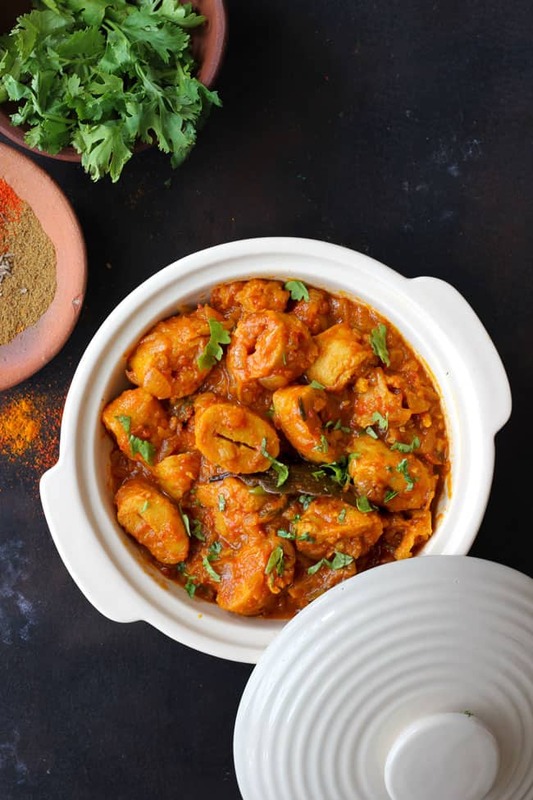 We have got for you spicy, masala loaded Punjabi Soya Chaap Recipe. It’s the real outburst of flavours just perfect to enjoy with lachha paratha or pulao. If you have never ever tried soya chaap masala before then surely this Punjabi soya chaap recipe is worth a try. It is an ultimate vegetarian comfort food packed with all the delectable Punjabi flavours. Soya Chaap is a kind of mock meat or vegetarian meat prepared with soybean chunks and flour. The dough is then wrapped around wooden sticks to give a mock leg piece like appearance. This is called soya chaap. And it is used to prepare vegetarian meat-like curries or coated in tandoori masala and grilled to serve as a snack. Either way, it is a fantastic protein source for the vegetarians. But soya chaap is not always gluten-free. If you are not making soya chaap at home from scratch then there is a huge possibility that the store bought one has white flour (maida) as one of the ingredients. Ideally, soya chaap is prepared with soybean chunks and flour but many manufacturers use all-purpose flour to bind the dough. So read the label carefully if you are looking for a 100% gluten-free soya chaap. The soya chaap adds great variety to the vegetarian menu. 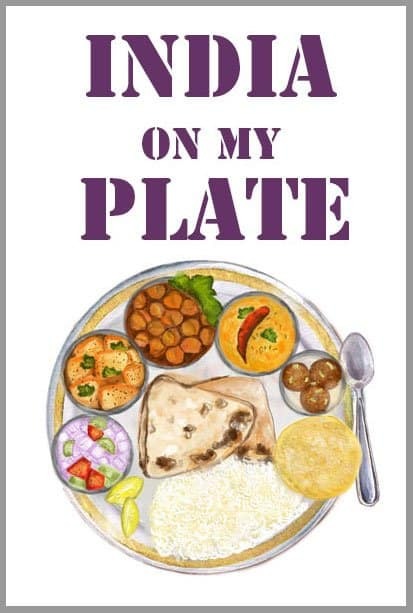 Especially if you are planning an Indian menu for the dinner party. For those who are looking for a delicious vegetarian curry other than paneer makhani, soya chaap masala is the answer. How does one make the kind of soya chaap found in Delhi? Soya Chaap Gravy is quite a popular street food across the Northern Region of India, especially in Delhi. During the evening time, many street cart vendors sell rich and creamy soya chaap masala with naan or paper thin roomali roti. That combination is truly for a hungry soul like me. I can devour a plateful of it any day. At home, I keep experimenting to recreate the magic of Delhi style soya chaap masala. And my recipe for soya chaap butter masala is very close to what you get in Delhi. 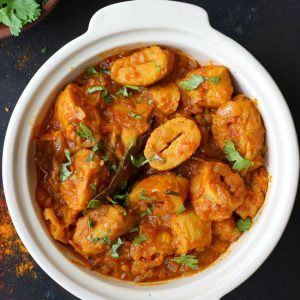 If you looking for something on a bold and earthy side, then this Punjabi soya chaap masala recipe is the right curry for you. Before I talk about the recipe, let me share a little secret with you. 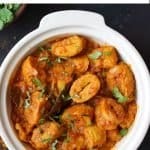 In any paneer or chicken curries, you can easily substitute soya chaap instead of the main ingredient (chicken/paneer). 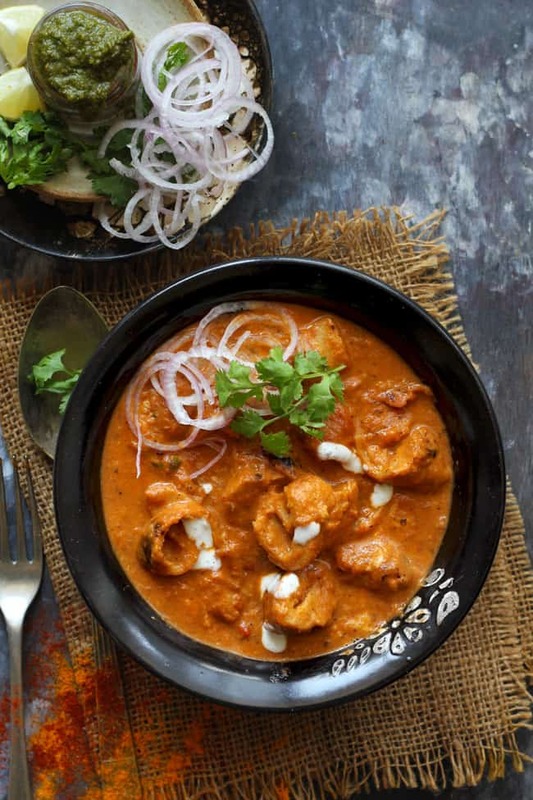 Soya chaap is a versatile ingredient that is perfect for the robust Indian curries. It certainly compliments the lavish and indulgent Indian curry recipes. Now I hope next time you see a packet of soya chaap in the supermarket, you have enough ideas to use it creatively. 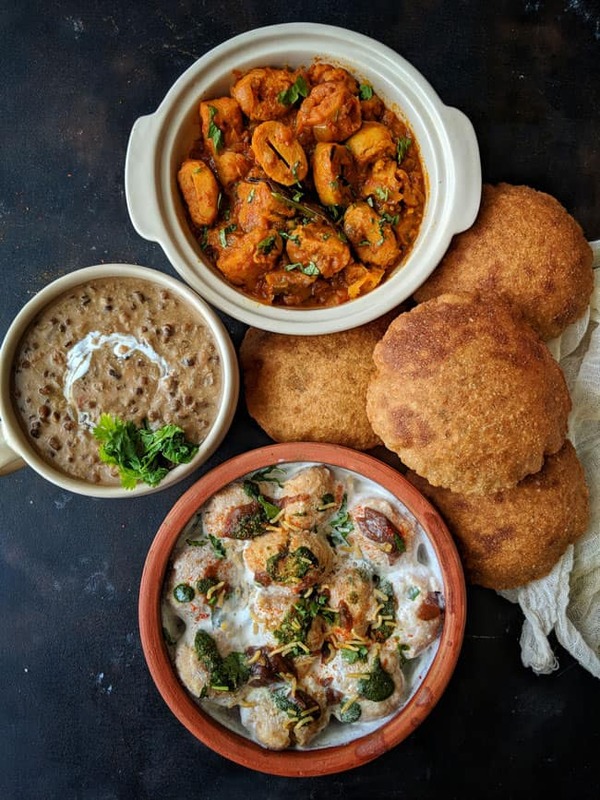 Recently, when I planned a vegetarian lunch for a bunch of friends the menu was – Dal Makhani, Punjabi Soya Chaap Masala, Dahi Bhalla, Bedmi Poori and Fruit Custard. Soya Chaap Masala was surely the show stopper. Everybody on the table just loved the soya chaap masala and it was gone in no time. 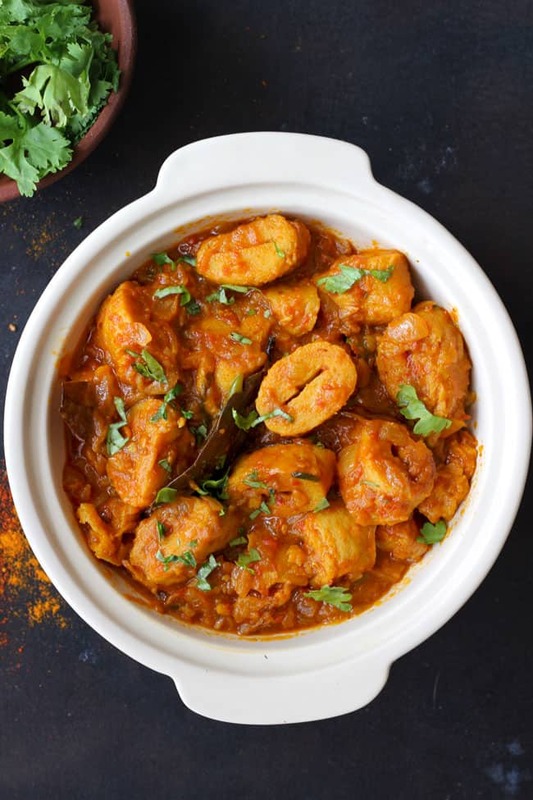 Hope you too win numerous accolades from friends and family for this soya chaap curry. If you try this recipe and love it, please leave a comment and hit those star rating buttons. This helps us grow and reach many other food lovers like you, who are looking for a perfect tried and tested recipe. 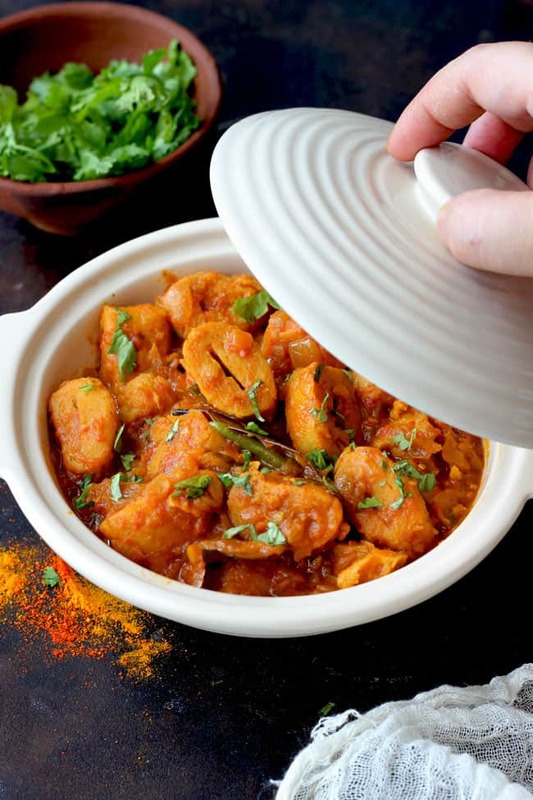 Punjabi Soya Chaap Recipe is an excellent vegetarian dish packed with proteins and real chicken like flavours. Learn how to make soya chaap masala in a few simple steps. Gently remove soya chaap from the sticks. You can easily slide them using a fork. Cut them into big chunks. Make sure not to make very small pieces of the soya chaap. Dress soya chaap pieces in red chilli, turmeric and salt. Mix nicely. Heat refined oil in a pan. Saute soya chaap pieces till they are nicely roasted or light brown in colour. Transfer to a plate and set aside. Heat mustard oil in a heavy bottom pan or casserole. Add bay leaf. Fry till the aroma is released approximately for 2 - 3 seconds. Next, add the chopped onion. Fry it over low flame till golden in colour. keep stirring at regular intervals while frying onion. Once onion is done add the ginger-garlic paste and fry it for 2 - 3 minutes or till the raw smell wafts away. Add the tomato paste, red chilli powder, turmeric and stir to combine. Fry the masala over low heat till it starts leaving the sides of the pan. Stirring at regular intervals. Now, add the roasted soya chaap pieces. Stir to combine and cook them covered over low heat for 10 minutes. Open the lid, add approximately 1 Cup of water, garam masala, green chilli and chopped coriander. Mix and allow the gravy to simmer for next 10 minutes over low heat. Serve Punjabi Soya Chaap Masala with chapati, rice or lachha paratha. If you are using frozen soya chaap defrost them as per packet instructions before marinating in the spices. To reduce the thickness of gravy add approximately 2 Cups of water instead of 1 Cup. Interesting Recipe! But I haven’t seen soya chaap anywhere near my place! Do you get it only in Delhi? Can you tell me where in Delhi do you get it? Nowadays, frozen packets of Soya Chaap are available in supermarkets like Big Bazaar, more, Hyer City, local sweet shops that sell paneer, vegetable vendors who sell paneer etc. In Delhi, it is so easily available. Don’t we should add water right after adding chaps? There could be many reasons for chaap to get burnt – less masala, light weight pan, or high heat. If you feel pan is scorching add 1/4 Cup of water while cooking the chaap covered.